Last month we here at Arc-Zone published the first article in a series of posts we are doing called Metal of the Month. The purpose of the series is to highlight different metals, provide readers with information about the properties of each metal, and offer our audience some general tips on how to weld with each metal successfully. This month we are going to discuss the metal Chromoly. 4130 steel-an alloy steel, is commonly referred to as chromoly, an alloy which contains chromium and molybdenum among other elements. The number ‘4130′ is a code that the American Iron & Steel Institute (AISI 4-digit code system) uses to define the approximate chemical composition of the steel. The ‘41′ indicates a low alloy steel containing chromium and molybdenum, while the ‘30′ indicates a carbon content of 0.3%. The American Iron & Steel Institute naming system is one of the most widely accepted systems. Is chromoly stronger than steel? Chromoly is stronger than normal steel, weight for weight, and is commonly used to make high-end bicycle frames, roll cages for race cars, and for fuselages on small aircraft. Chromoly’s high strength-to-weight ratio and high tensile strength makes it an ideal choice for these particular applications. In addition, 4130 is utilized in a variety of applications because of its weldability, formability, ductility and toughness. Overall it is considerably stronger and more durable than standard 1020 steel. While this particular grade of steel does contain chromium, it is not in enough quantities to provide the corrosion resistance found in stainless steel. Regarding the manufacturing of high-end bicycle frames, chromoly is typically used to make bikes lighter rather than stronger. This means that manufacturers use less of the steel so the strength is the same, but the weight is reduced. However, the stiffness of the steel is approximately the same, so with less of it to be stiff, the chromoly bike frame ends up more flexible than the standard steel one. One of the most important characteristics of chromoly is its ability to be case hardened by carburization of the surface. The core of the material retains its bulk properties, while the outside is significantly hardened to reduce wear and tear on the part. This makes this particular grade of steel an excellent material for such uses as gears, piston pins, crankshafts, etc. Welding 4130 is not that much different than welding steel or stainless steel as far as technique is concerned. There are just additional considerations to keep in mind when welding with chromoly. Research has been done that indicates that TIG welding is the fastest, cleanest and best way to weld 4130 chromoly tubing without risk of compromising material properties (provided the thickness does not exceed .120″). There are six main things to keep in mind when TIG welding 4130 chromoly tubing. With the proper equipment from your friends over at Arc-Zone.com and the following tips, you’ll have the knowledge you need to successfully weld with chromoly. 1. Prepare the area to be welded thoroughly, ensuring that joint surfaces are smooth, clean and completely free of contamination. 2. Preheat is not necessary for tubing under .120″ thick, however, it won’t hurt anything either. If the ambient temperature is less than 60 F°, preheat to at least 100 F°. This can be easily accomplished with a small propane torch. 3. Make sure to weld a little bit slower than normal. This will slow the cooling rate and negate any chance of the welded area cooling too fast. 4. Do not allow and breeze or drafts into the room in which the welding is taking place and do not speed cool the welds. 5. Use a quality TIG machine with high frequency starting to eliminate arc strikes. Doing so eliminates any chance of a brittle spot or cracks from forming. 6. 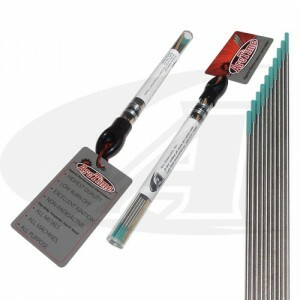 As with your TIG torch, make sure you use quality tungsten electrodes from a trusted supplier. Consider using tungsten like the ArcTime(tm) hybrid tungsten electrodes which works with all machines and for all metals. 7. Do not use 4130 rod. Using a slightly under matched filler metal gives better overall properties and just plain works a lot better . Use E70S2 TIG rod and call it a day. Taper off slowly to avoid crater holes that will turn to cracks later on. I am working on a racecar (nhra) and the rollcage is supposed to be chromoly. Some of the car appears to be tig welded, but the rest mig. How can I figure out the material with out spending big money on a ultrasound meter. Dennis, I have the same problem. The SFI states that if mild steel is used on a chassis, it has to be 0.120 wall min. If the car was ever certified, then any material on the car that is less that 0.120 wall is more than likely 4130. Any material in the roll cage area (on my Front engine dragster, from the motor plate back) that is less that 0.120 wall and is MIG welded needs to be removed. Currently I am completely replacing the back half of the car because mild steel was welded to 4130 with MIG. This might be fine in everyday use, but will not certify. I check tubing wall by drilling a 1/8 hole away from any weld. Then I take a piece of 1/16 welding rod that I have bent at 90 degrees and stick it in the hole. With the bent part of the rod held tight against the inside of the tube wall, I mark the outer wall of the tube on the rod with a scribe. I remove the rod and can measure the wall thickness. This method gives you a fairly accurate answer. When I did this on the dragster, the shoulder hoop was 0.049 wall. It was probably 4130, but that is still too thin for the SFI 2.6 Certification. Get the appropriate SFI spec. from http://www.sfifoundation.com/. This will help determine what you have to replace. If you have any doubt, replace it. It is better to be safe the have something break loose when your upside down at 150 MPH. Get a Coal-chisel and strike the frame where you want to determine the type .4130 will ring like a bell. Where as pot steal will sound dull and use a magnet to find out what is inox and what is pot metal. A centre punch will give you an idea what the Rockwell is.
. Once you see it you will easily recognise it. I am working on an atv. Want to know if 4130 can be arc welded?? If yes, how will it affect the strength of the chassis. Also can mildsteel or other tubings like 1020 be welded on the 4130 rods? how much is the cost of 80 metres pipe or 60 kg CHROMOLY4130? Thanks for stopping by….we don’t sell metal, just all the TIG, MIG and Plasma Arc Welding accessories you need to weld! How does chromoly steel do in oxygen deprived environments suce as the rudder shaft for a sailboat? Does it chemically alter and become weakened such as stainless steel does? IS 4140 HAVE THE SAME PROPERTIES AS 4130? I;VE BEEN STUB SHAFTING WITH THIS MATERIAL AND I TIG THE ROOT AND MIG THE REST OF THE WELD. I PRE-HEAT TO 600DEGREES BEFORE WELDING THEN STRESS RELIEVE AND COVER WITH K-WOOL SLOWLY. IT ALWAYS SEEMS TO CRACK!! WHAT AM I DOING WRONG???? Gradually bringing the temp down by post heating ,and submerging in vermiculite will do the trick. It will take up to 24hours to reach room temp. This will work on any surface hardening or reclaiming also. Just has a higher carbon content. What is the best chromoly for making a set of Cam Gears for A SR20DET 4 cylinder engine making 500 hp. I want it to be as lightweight as possible and as strong as possible. Hello, Is arc welding is possible on aisi 4130 (cheomoly)?? & then what about the strength of the material after arc welding on it???? Is there any specific dangers when grinding this material?